Organization and taking back control and order of your life. Something that is not a lot of fun but oh so worth it when it’s done, and you can feel like there is some order and you can manage your home and work life better. I have written a lot of simple organization ideas and a lot of organization posts have been linked up to my weekly linkup, so I rounded everything up to give you. 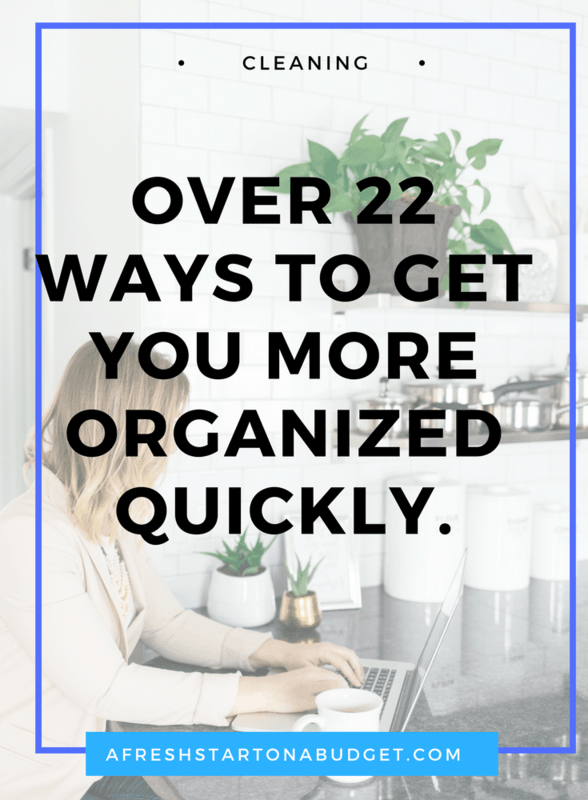 If you need help getting your life more organized here are over 22 posts that will get you on the right track. 1. One of the first ways to have more control over your life is to get your calendar organized and in order. 2. Here are some examples of great planners and calendars to get you started. 3. Or you can DIY and make a Home management binder to organize your life. 4. Here are some easy ways to organize your bathrooms for less. 5. Remember to have realistic expectations of how perfect your home should be. 6. Another great example of how having a planner can help keep you organized. 7. Some great and practical tips for managing your home. 8. Here are just a few of my simple organization tricks. 9. To become more organized try doing some things differently. 10. Here are some really great organization ideas to help you out. 11. Looking for ways to organize your photos, some great advice on how to do that. 12. Here are some ideas on Pantry Organization. 13. Need laundry help, don’t we all check these posts out. 14. How to set goals, so you can accomplish more. 15. some meal planning ideas to use up what you have. 16. Here are some ways to make clearing clutter a little easier. 17. What to do when your kids have just way too many toys. Don’t they all have too many toys or just my daughter? 18. A bunch of different ways to organize your kid’s school stuff. 19. Do a little bit at a time to keep you moving and not get overwhelmed. 20. Organizing can be simpler with these easy steps. 21. Office organization ideas. That I need to use too. 22. Some of my favorite ways to make home organization easier. The tip about doing a little at a time is good. Too often, we attempt to do the whole taks in one go, and end up abandoning it. This must be a gift of yours, Karissa. It looks like you’ve got lots of great resources here! This topic would be a fun link-up, too! What a great post with so many tips! I found you on the Weekend Retreat Link Party! Pinning so I can finish reading all of them later!! Erica recently posted…Decorating above the cabinets… What the heck can I put up there? I always feel so much better when my house is clean and organized. I can always tell when life starts to get out of control by how messy things get. As much as I love technology, I love using my planner! This is perfect!! We’re moving this weekend so organizing is going to be a must. As I look at my totally messy desk I am thinking a lot of these tips could come in handy LOL. I am so unrealistic in my expectations of what I can do in a day. I write everything down that I want to do and then crucify myself when I don’t get them done. I’m gonna work on that and remember there is only ONE me! Thanks for this! Really enjoyed your post – I am a great organizer when I know the direction I want to go – and that’s just what you’re giving – particularly like the calendar choices!! Donna Ward recently posted…Got a Blog With a Community? Fantastic tips to help you get organized! Thanks for sharing 🙂 Organization is so important in every area of your life and business!! Great post! I have to do a lot of decluttering, in a short time period, and get myself organized, for a future eventuality. I’m glad I’m being forced into it, but I am a disorganized person – I hope some of these suggestions will help me. My favorite one was the organizing book with the stickers. I’m thinking about investing in it. You made it sound so great! These are great tips. I always love doing my works in a organized way, so it makes my days easier. I would love those tips foe managing my home & also lot of help on my laundry. Thanks for sharing these. I love organizing! These are such great posts on how to become even more organized! Thanks for sharing!! Ooh, I definitely want to refer back to this in my organizational quest of 2015 haha. Thanks so much for linking it up at #MeetUpMonday! I love being organized, that doesn’t mean I always am lol but these are awesome tips. Thanks for sharing! What a great blog! I need to come back and read it all because I need to go back in being a little bit more organized. I lose everything and you have great ideas on how not to do that! Thanks for taking the time to help others. Carmen recently posted…Did you eat? Are you clean? Wow! What an excellent list of resources. Organization does not come naturally to me and always need to draw on inspiration from others! Spring cleaning time is upon us! Thanks for the excellent quick tips. Such great information. I so need to organize my photos…and closets. I like the idea of trying to do a little every day so it doesn’t pile up. Now I just need to do it! Thank you for providing so many great resources!! Thank you for the reminder! I do need to get organized! It’s nice that you have such a long list of ideas all in one post! Thank you for the organization tips!